The public hearing on SB 357 has not been set but is likely to be held on the morning March 5 in room 103 of the Legislative Office Building. Check here on Thursday or Friday to find out for sure. Last Wednesday, a 19-year-old dropout came to the Florida school he once attended and opened fire on his former classmates. The Associated Press report of the mass murder noted that the shooter was equipped with a gas mask and smoke grenades, set off a fire alarm to draw students out of classrooms, and opened fire on them with an assault-style rifle. Students who knew the shooter described how his volatile and strange behavior caused him to lose friends and become more and more isolated. That argument is a red herring. There are many things we can — and should — do, including developing meaningful restrictions on gun ownership and, most important, rejecting the National Rifle Association’s poisonous worldview. History shows that such an approach can make a difference. The NRA mission has changed dramatically since the 1960s and early 1970s when it focused on sportsmen, hunters and target shooting. After the organization’s leaders supported the federal Gun Control Act in 1968, a group of NRA members banded together to elect individuals who would seek to repeal the bill and expand gun-owner rights. By 1977, that group had taken control of the NRA and determined to make the organization into a formidable lobbying force. That activist group’s political views dominate the legislative agenda of the NRA today, drowning out the views of more moderate members in the organization and framing the national debate on guns. In the recent past, the NRA’s “slippery slope” argument — that any restrictions on guns will inexorably lead to the confiscation of all guns — has seldom been challenged and is often trumpeted by politicians. The NRA’s mantra that “guns don’t kill people,” and its variants, such as “mental health is the issue,” have dominated the public discourse on gun ownership. And finally, the public accepts the NRA’s contention that the issues that lead to mass murders are so complex they defy any kind of legislative remedy. As a result of the way the NRA frames the debate, we have not engaged in any meaningful debate on how we might limit the purchase of guns or confiscate guns from individuals who might pose a danger to themselves or others. We’ve determined that those on the no-fly list, those who are mentally unbalanced and threaten to kill people, and those who are under temporary restraining orders should maintain their Second Amendment rights at all costs. Unfortunately, those costs include the loss life of students and teachers in schools, of those attending night clubs in Florida, of those attending street festivals in Nevada, of those attending movies in Colorado, of those attending church on Sunday in Texas, and those who are killed in domestic disputes and suicides where guns are involved. Despite the mass killings, we have been unwilling to limit the rights of anyone to acquire any kind of gun and carry it anywhere because we have accepted the NRA’s most devastating assertion of all: Citizens need to have guns to protect themselves from each other, and from “the government.” Which means neither the slaughter of innocent civilians nor the presence of armed militias in Charlottesville, Va., “to provide order” compelled any legislative action — except to call for more citizens to carry concealed weapons and to encourage more “armed volunteers” to patrol school grounds and public spaces. We have, in effect, adopted the view that vigilante justice needs to replace the rule of law. So what can be done, apart from offering “thoughts and prayers”? One proposal calls for a strike by teachers on April 20 if states fail to enact sane legislation on weapons in schools. In New Hampshire, we could start by passing a law that allows local school boards to enact policies that restrict weapons in schools. As reported in several Valley News articles, the New Hampshire Attorney General’s Office has ruled that only the Legislature, not school districts, can enact firearms bans, except for students and staff. If the Legislature is unwilling to enforce the federal laws regarding gun-free schools, they should at least give locally elected school boards the authority to ban weapons. If local control is the hallmark of New Hampshire government, giving local boards this authority makes perfect sense. Second, the New Hampshire Legislature could repeal the bill Gov. Chris Sununu signed into law a year ago that did away with the requirement that gun owners have a permit to carry a concealed handgun and removed the ability of local police chiefs to deny such a permit. My grandchildren shouldn’t have to live in fear when they go to school. Schools shouldn’t have to spend millions of extra dollars on security. Troubled people shouldn’t have to be profiled because we can’t figure out how to develop effective background checks on gun buyers. And most of all, lawmakers shouldn’t be encouraging citizens to take up arms to protect themselves against the government. Instead of taking the NRA’s the “every-person-for-themselves” approach, legislators should promote a collaborative view of the world, a world in which school boards, selectboards, police departments and social service agencies are encouraged to team up to help troubled people connect with the community — a world in which hope replaces fear. By ANHPE in Bills on February 26, 2018 . 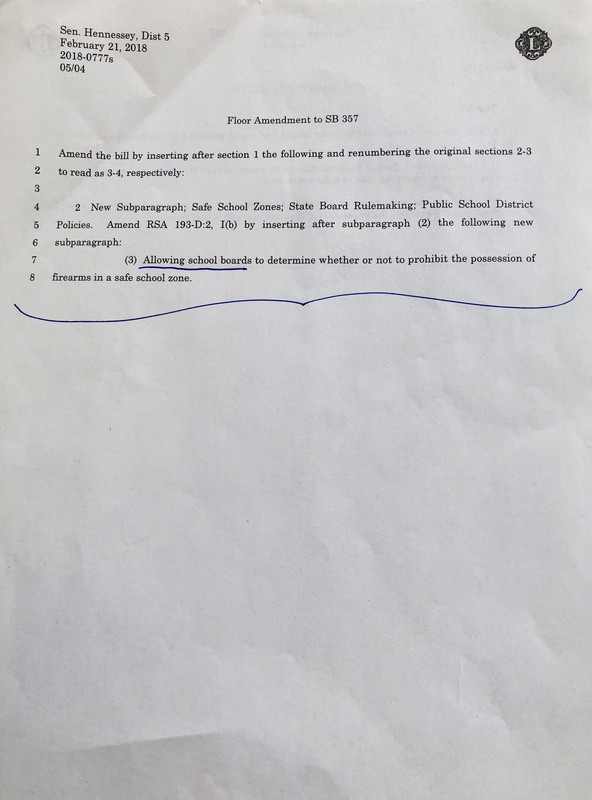 This bill needs to be supported; local School Boards know their communities and their schools and should be able to make such a determination. Support this bill!